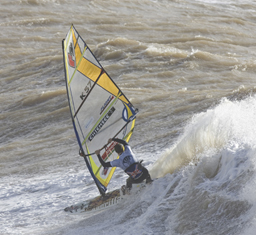 The White Air extreme sports festival on the Isle of Wight kicked off this weekend with the British Open Beach Slalom windsurfing competition. Perfect but blustery conditions at Yaverland beach saw the riders achieve excessive speeds. The beach start was made even more challenging by a strong onshore wind measuring Force 6 and gusting Force 7 later in the afternoon. A Super X Slalom was also held, pleasing the crowds and ensuring an exciting afternoon for riders and spectators. Aaron Williams won the Beach Slalom to guarantee himself a place in the finals while the first round of Super X saw James Dinsmore in poll position with Matt Wemms coming top in the second round. The action continues all week at White Air with more windsurfing and kitesurfing. The ‘Freewave’ British Open Championships is underway as we speak with the freestyle events for both sports coming later in the week.